We tape all. You do not need to be a CrossFit Menace Member to take advantage of the Rocktape Process. Just call or visit ahead of time to schedule a taping time so we can make sure Coach Gavin, our Certified Taping Coach, is accessible. SMALL TAPING (Fingers, Hand, Ankle, Wrist, Neck) - $8.00 ($5.00 if you supply your tape). MODERATE TAPING (Arm, Elbow, Knee, Shoulder) - $12.00 ($8.00 if you supply your tape). LARGE TAPING (Upper Back, Lower Back, Hips, Ribcage, Quads, Hamstrings) - $16.00 ($10.00 if you supply your tape). RockSauce Application - Add $3.00 to any Taping Application. RockSauce is a topical pain relieving gel made from Menthol and Capsaicin that works in tandem with RockTape. RockSauce will be massaged into the target area prior to Tape application for immediate relief, and then wiped away before tape is applied. Then, at the request of Patient, RockSauce can be rubbed/worked into the RockTape, post clinical tape application. The RockTape absorbs the RockSauce, allowing it to act as a time-release pain management protocol. Click Photo Below To Cycle Through Gallery. Because of its versatility and unique design (in comparison to other kinesiology tapes), Rocktape is used for a wide variety of applications. 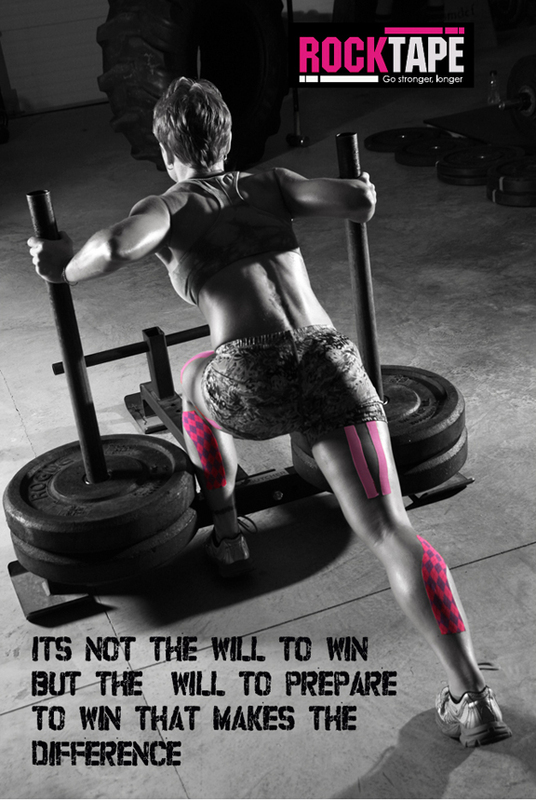 Rocktape was built with the athlete in mind. Rocktape not only works wonders for injuries but also assists in coordination and movement. For instance, when athletes start to fatigue, they break form. Once form is less than optimal, so is performance, because form and function are interconnected and co-dependent. What Does ROCKTAPE (Kinesiology Tape) do? The Three Biggest Misconceptions of Kinesiology Tape. I find it amusing, if not somewhat disconcerting that so many clinicians and athletes don’t take the time to learn more about kinesiology taping. The number of times I have heard people scoff, with little to no information on which to base said scoff, tells me it is time to start pointing some people in the right direction. So, let’s break down some common misconceptions about Kinesiology taping right here and now. I am not going to go through all of these points and try to convince you of the exact effect. I will just point you in the right direction with lots of links and thinking points. Misconception #1 – Kinesiology Tape only effects the skin, and hence has minimal effect. The brain/nervous system and skin develop as the same germ layer in a growing embryo (ectoderm). This is exclusionary; all else develops in the mesoderm or endoderm (the other two germ layers). But the nervous system and skin, they get their own layer. They are buddy-buddy. They are extensions of one another. If you’ve taken an embryology course in your life, take a look back at that textbook. There are three main types of feedback during motor learning: visual, auditory, and…you guessed it: tactile (AKA Haptic). Yes, this topic is much more complex and each of these has sub categories. If you really need to be convinced that all three are important for accelerating the learning of novel tasks or highly complicated tasks, then simply let me Google that for you. You may also find this robotics-inspired tactile feedback garment rather interesting. Oh, and here’s an interesting abstract about feedback. Note the 100% feedback for relatively complex tasks. Interesting, right? So there is something to this tactile feedback stuff? Superficial fascial layers of the body are more densely populated with mechanoreceptors than tissues situated more internally. For a short insight, check out A theoretical framework for the role of fascia in manual therapy. Make sure to go through the reference list on that one, and check out Schleip’s interestingly written article here. Now, I am not guaranteeing that effecting the skin and superficial layers of fascia will result in exactly the effects you would expect. Honestly, I don’t know anyone who has really come up with an all-encompassing system of effecting the skin and fascia, although lots of clinicians are well on their way to a global system approach. Go find Luigi Stecco, Thomas Myers, or Diane Jacobs as some good places to begin. Prior to the advent of kinesiology taping, most people (clinicians and lay public) viewed taping as a purely mechanical endeavour. For all intents and purposes, taping was strapping. It was meant to prevent motion in a one or many planes. As you may have guessed by the last two misconceptions, a lot of the effect (as I teach it, anyway) is through cutaneous/neurological/fascial feedback loops. In my opinion, if that’s all you understood about Kinesiology taping, then you’re well on your way to being a dandy tapeologist. However, one large effect of kinesiology tape that is often overlooked is the local decongestion effect. It has been theorized that this is one of the means by which it delivers stimulation to the many mechanoreceptors in the area. It is a simple lifting effect through tenting of the skin and hence altering (and theoretically decompressing) the cutaneous and subcutaneous mechanorceptors. Cool, eh? But here’s another coolish (patent pending) tidbit: It has the same effect on blood and lymph vessels. I know all the latest craze is compression instead of ice (let’s not go there), but how about a little decompression? Hard to accomplish…unless you have tape. One of the issues with acute injury, and sometimes chronic injuries of just the wrong sort, is the inability of the body to manage its own fluid dynamics. I remember when I cracked my femur on a tree snowboarding in 2010. My left thigh was swollen to twice the size of the other one (not the picture here, mine was much, much grosser). No surprise. However, gravity being a prick and whatnot, the swelling took about 3 days to work it’s way down to my foot and ankle. I had never experienced this before; the excess of inflammatory byproducts sitting in my ankle made it nearly as sore as my femur. My toes were purple and my ankle dorsiflexion was restricted far beyond the contralateral side. These deleterious effects lasted for a few weeks beyond my return to activity, until I specifically addressed the issues. The point being, edema is an issue in and of itself. So how do we move the swelling around? Ding ding ding! Tape it. I don’t have to lay out a plethora of RCTs or research on this one (although it is starting to pile up). All you need, again, is the power of Google.